Differences Over Migration Policy Throw German Government Into Crisis Chancellor Angela Merkel's coalition partner wants to bar migrants from entering Germany if they've applied for asylum elsewhere, and has given her two weeks to tighten asylum rules. German Chancellor Angela Merkel leaves a press conference after a leadership meeting at her party headquarters in Berlin on Monday. Hardliners in her conservative bloc want to bar asylum-seekers from entering Germany if they've already applied or registered for asylum in other European countries. In her fourth term as German chancellor, Angela Merkel is going through her biggest political crisis. A struggle over migration policy has threatened her government. 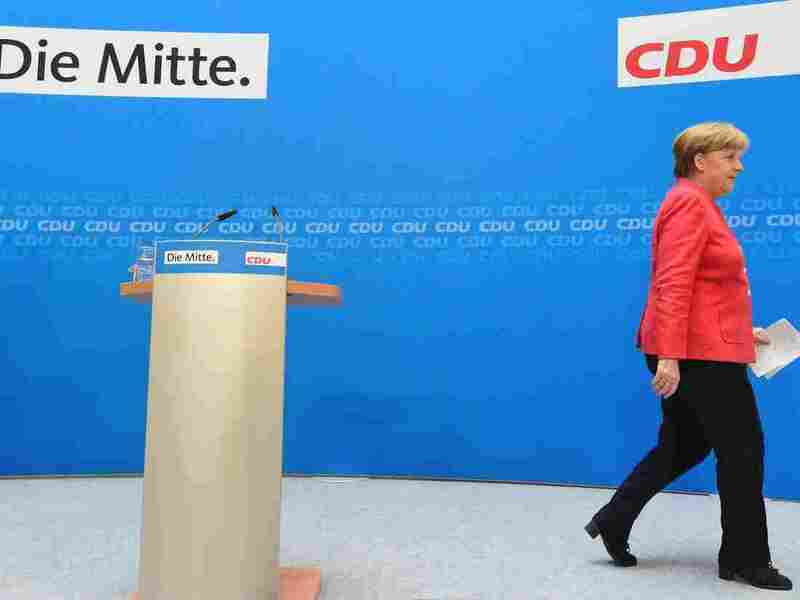 The political opponent undermining Merkel's political line comes from her own coalition — from Germany's interior minister Horst Seehofer, the leader of the Christian Social Union (CSU), the sister party of Merkel's center-right Christian Democratic Union (CDU). More than 1 million migrants came to Germany in 2015 and 2016, following Merkel's 2015 decision to leave German borders open for them. According to Seehofer's so-called asylum "master plan," Germany should start turning back migrants at the border who previously applied for asylum or registered as asylum-seekers in other European countries. Merkel is strictly against this change, saying such a unilateral move by Germany could threaten the very unity of Europe. "We think that turning people back without consultation at our borders, as a country at the heart of Europe, could lead to negative domino effects that could also hurt Germany and ultimately lead to the questioning of European unity," she said at a press conference on Monday, after a meeting with her party's leadership. With neither leader budging, the conflict escalated over the weekend, leading to fears that the government would collapse. But both parties agreed Monday to postpone a final decision. Seehofer has given Merkel a two-week deadline, until July 1, to make deals on migrants with other European countries. Merkel will meet with other EU leaders at a summit late next week. "Seehofer has the majority of the people behind his position, as well as big sections of Merkel's CDU and all of his CSU," observes political scientist Heinrich Oberreuter. "Those are all very interested in security and legal force. Merkel's argument for Europe is substantial — but not popular." President Trump also weighed in, tweeting Monday: "The people of Germany are turning against their leadership as migration is rocking the already tenuous Berlin coalition. Crime in Germany is way up. Big mistake made all over Europe in allowing millions of people in who have so strongly and violently changed their culture!" Crime in Germany has in fact dropped, according to government figures and a statement by Seehofer released May 8: "At roughly 5.76 million, the number of criminal offenses committed in Germany is the lowest since 1992," Seehofer said. Merkel and Seehofer both argue that the law is on their side. "Seehofer's version is all about restoring law and order at the border. Pushing back refugees who have already been registered in another EU member state would be against EU rules," says Franz Mayer, an expert on European law. In opposing Merkel on immigration, the CSU may have a bigger aim, Mayer warns: "Arguably, their real motivation is to push Chancellor Merkel out of her office. The whole development must be seen against the background of upcoming elections in Bavaria, the homeland of the CSU, in fall." The CSU fears that without a tougher migration policy, the far-right, anti-immigrant Alternative for Germany (AfD) party "will become stronger in Bavaria at the expense of the CSU," says Jürgen Falter, a political scientist and expert on Germany's far right. "After all, the current debate is kind of a reaction to the politics and polemics of the AfD. " In elections last September, the AfD became the first far-right party to win seats in the German Bundestag in half a century, mainly due to its populist, anti-immigrant agenda. There are claims that Merkel's politics created the political space for the AfD. "The AfD is a product of the refugee crisis and the corresponding consequences people are feeling today," says Falter. "By now, the AfD has established itself as a protest party. They are the only party represented in the German parliament being strictly against the German asylum and migration policy." By taking a hard line on migration, CSU hopes to position itself as a strong alternative to the AfD in Bavaria's elections. If Merkel can't reach a comprehensive solution with EU countries in the next two weeks, the situation could quickly escalate, experts warn, possibly leading to a collapse of her coalition. One possible scenario: In Bavaria, Seehofer could order Germany's border police to close the international borders to refugees. If that were to happen, Mayer says, Merkel would have the authority to fire Seehofer. That in turn could mean the CSU would leave the government — which could lead to fresh elections, which might benefit the AfD. While Merkel is determined to reach a European solution, Falter argues that she could eventually compromise to save her government. But, he emphasizes: "Merkel does not want to be the gravedigger of Europe." Editor's note: This story has been updated to note President Trump's inaccurate claim in a tweet about migration that Germany's crime rate was "way up."